Ask a social entrepreneur which came first—the mission or the product—and the conversation may begin to feel like a chicken-and-the-egg question. For Dave Simnick, the 25-year-old CEO of SoapBox Soaps, it was “mission first, product second.” Dave’s dedication to giving back began with his experience as an Eagle Scout, continued when interning at a non-profit after college and solidified when he worked for the Teach for America program. 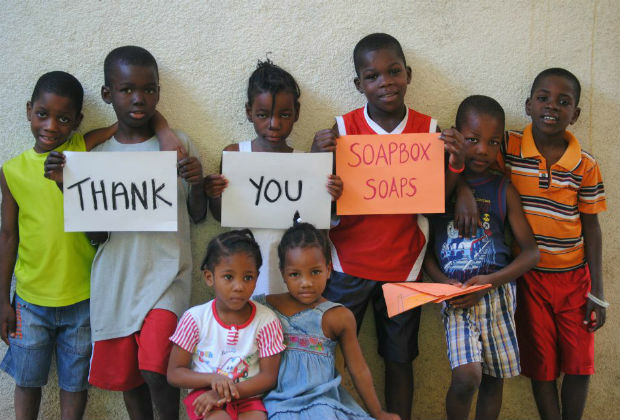 SoapBox’s mission is “to empower customers to help the world with everyday purchases,” says Dave. More than three years ago when he was working for a USAID Sub-contractor, he noticed that simple hand washing with clean water and soap could save thousands of lives everyday. Dave called his high school friend and fellow Eagle Scout, Eric Vong, and said, “We have to do something about this.” According to Dave, 24,000 children under the age of 5 die every day from preventable disease. Of these 24,000, approximately 3,000 die because they lack access to clean water and soap. With no idea of how to make soap or build a business from scratch, Dave and Eric started out in the basement of his college house with the following business proposition: for every bar of soap purchased, another bar of soap would be donated to a child who lacked access. That child could be at a shelter in town or in a developing country, although they are increasingly integrating their sales and donations to keep it all within the community. While SoapBox was still getting off the ground, Dave had started another company called TalkChalk that aimed to solve problems he saw in his Teach for America classroom in Northern Philadelphia. As both companies grew, one of his mentors pulled him aside and taught him lesson one: a social entrepreneur cannot do two startups at once when just starting out. So he closed down TalkChalk with his business partner, Dan Doll, and doubled down on SoapBox. After a year of pleading, Whole Foods gave them an opportunity to trial their products in one of their stores. “I stood behind a demo desk in that store from 9am to 9pm on as many days as they would let me,” David laughs, “And it worked.” The trial sold out of SoapBox’s products multiple times and Whole Foods expanded them into eight stores and eventually to an entire region, but not until they realized that their first run of product wasn’t good enough and it was hurting sales. They improved the formulation and switched out the bars in all the stores to turn sales around. Lesson two: customers buy quality product first, and mission second—the opposite of their vision statement. This experience led to their third major insight: if the focus is too much on the social benefit of a consumer product, customer behavior will mirror charity donation behavior, resulting in periodic rather than regular purchases. This informed their marketing decisions for packaging and promotion. Dave and his team were able to learn from these experiences because they were open to them and surrounded themselves with advisors who knew more than they did about the retail business. SoapBox Soaps has also been an environment in which they allow failure to teach, whether in the market or among the team. Today they have a national presence in 350 stores, and an early angel investor just helped them raise additional capital to broaden their product line. Recognizing that the bar soap business has tight margins, they are adding lotions and other products to their portfolio. The sales curve looks good right now and Dave is still living the Boy Scout oath— “On my honor, I will do my best…to help other people at all times,” one bar of soap at a time. Dave may have started when he was in college, but When It Comes to Startups, Does Age Really Matter? To meet a “social” entrepreneur of a different sort, check out our webs series, Startup Revealed. ⇐ JFK Promised Us the Moon, What Can We Do for Ourselves?